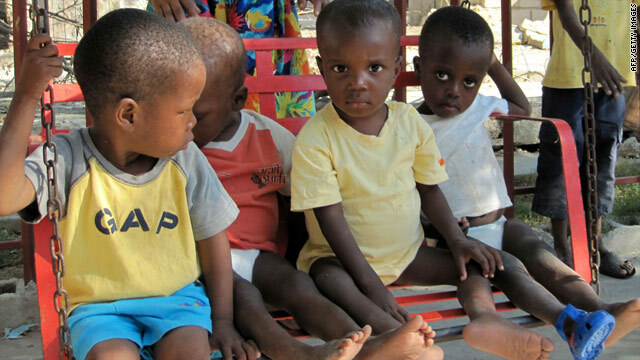 The U.S., aid groups and Haiti are working to ensure that orphans are protected from child traffickers. State Department: "We have concerns about traffickers," "pedophiles"
Spokesman said he wasn't aware if children had been brought illegally to U.S.
Haitian prime minister: In aftermath of quake, trafficking is "one of biggest problems"
Washington (CNN) -- The United States will work with the Haitian government and with international and private aid groups to protect Haitian children who might be at risk because they were orphaned or separated from their parents by the earthquake, the State Department said Thursday. "We have concerns about traffickers, we have concerns about pedophiles," State Department spokesman P.J. Crowley said at his midday briefing. "We've seen a couple of cases of those in recent days. So this is just something we are working collectively with those organizations that are actively trying to help children, people on the ground, be alert for this kind of danger." Asked whether any children had been brought illegally to the United States, he said, "Not to my knowledge." "A number of people, including many, many children, have been displaced, separated from their families. This poses great risk, and particularly for children, [of] a higher vulnerability to human trafficking," Crowley said. "Haitian police have had child protection brigades in place for some time. Obviously, we are working with them but also trying to supplement the capability on the ground." U.S. officials from the departments of State, Homeland Security, and Health and Human Services have been working together in recent weeks to make sure that the Haitian government grants its approval before any adoptions proceed. Since the earthquake, 500 Haitian children whose cases had long been under consideration have been approved for U.S. adoption and brought to the United States. In a news release issued later, Crowley said the State Department's "Office to Monitor and Combat Trafficking in Persons has been engaged on this issue prior to the earthquake and in its aftermath." While UNICEF -- the United Nations' children's fund -- "has taken the lead role in overall child protection and safety in Haiti since the earthquake, we are working to supplement their efforts in combating child trafficking," he said. Steps being taken by the State Department and other organizations, he said, include registration of unaccompanied children, helping "remobilize the Haitian Police's Child Protection Brigades," and "rebuilding the capacity of Haitian [non-governmental organizations] already working to protect child domestic servants, known in Haiti as restaveks." He said the department's Office to Monitor and Combat Trafficking in Persons had been working to fight child trafficking in Haiti even before the earthquake. Haitian Prime Minister Jean-Max Bellerive said in an exclusive interview with CNN's Christiane Amanpour on Wednesday that after the quake, because of the growing number of orphans, illegal child trafficking is "one of the biggest problems that we have." "There is organ trafficking for children and other persons also, because they need all types of organs," Bellerive said. He did not give specifics but when asked whether there is trafficking of children, Bellerive said, "The reports I received say yes."